PRODUCT: 3/4 inch size Galvanized Steel Adjustable Roof Vent Pipe Flashing (IP Jack). Fits flat to 5/12 Pitch Roofs. Price/Each. Base Size: 11 x 13". 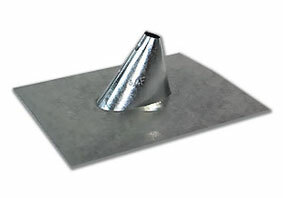 APPLICATIONS: Design fits flat to 5/12 pitch roofs. Standard flashings are generally acceptable for use with steel and soil pipe, ABS, PVC, plastic or EMT (electric metal tubing).